What does SEO mean? On-page and off-page SEO explained. SEO stands for search engine optimisation, which usually means to enhance a website for better position on search engine result pages. Known as SERPs. A search engine result page is a list of results returned when someone types a query into any search engine. The term SEO can also include the refinement of a company’s online profile, outside of the website itself. Google likes to see a big effort made and rewards websites that abide. Because so many factors affect a company’s rank on a search engine the term ‘SEO’ can now mean a number of things. On-page SEO is a division of SEO which, as the phrase determines, takes place on the website itself. Mostly on individual pages. Website build through to written content will have an influence on where the website is positioned. Here’s how. Our obligation is to help search engines understand why the website has been created. Search engines predominantly understand HTML (Hypertext Markup Language) – the standard language developed to build web pages and applications. Similar languages have been written to add functionality and to comply with rules such as DRY (do not repeat yourself). Whatever is used, each page should be clearly and correctly marked up so that search engines understand them. Often, in-a-box website packages add unnecessary code to enable non website designers to make design changes. Which is less desirable for search engines to sift through. When the web pages are put together, HTML elements like title and paragraph tags show search engines what is most relevant in the page. HTML5 and schema markup are now the standard ways to let search engines decipher the page. H1 tags should be used at the beginning of the page to let the visitor (and search engines) know what the content will be. The H1 tag usually includes key terms, however do not force this. H2 tags, paragraphs, links and media should all then be correctly tagged as a page hierarchy. Think of good written content as healthy search engine food. Search engines need content. Well written pages supply search engines with information that help their users once a query has been made. This is the basis of ranking well – providing informative answers. If content is food then media can be search engine treats, they spark a lot of interest. Photos are listed in their own right on Google image search, which again helps pages to rank higher. Increasingly, YouTube videos are the top result on certain searches. YouTube is owned by Google and is a massive search engine in its own right. Ultimately search engines – like Google – strive to provide users with the most appropriate answer and the best experience. Which is why the next few SEO tactics are so important. Websites should be really easy to move around. This is not only for humans, but also for search engine crawlers. These crawlers spider websites, discovering content. When pages are well linked, and those links are marked up crawlers find them easy to crawl. Over 60% of searches made are on a mobile device. If a website is not mobile friendly this creates a difficult experience for the user. This is why mobile friendly websites are rewarded on SERPs. Considering so many searches take place on mobile devices, website owners must be sure that the site downloads quickly on 4G connections. Google has the ability to test download time. If a page takes too long, it won’t rank well. Google doesn’t send users to a slow loading site. Users will just leave sites that take longer than 2 seconds. That’s just two seconds for you to capture a new client. More important than you might think is your ABOUT page. Google looks for clarity in a company website, a sense of honesty. Writing about the background of your business and yourself, the business owner, clears uncertainties and helps buyers make decisions. Align this with your social media and directory listings. Google will pick up signals about your business from all over the internet. Which leads us to off-page SEO. Off-page SEO has become more important in recent years because it is somewhat more barefaced than on-page SEO. These are influences that are largely controlled by the company’s clients and colleagues. Which is why they are also feared. Google likes to see others appreciate your hard work and your awesome content. That way they really can recognise the effort you make. This makes off-page influences so valuable. There are a few popular and widely recognised review sites like Facebook, LinkedIn, TripAdvisor, Yell and Google+. These large, well known sites already hold millions of loyal user profiles and they spend time weeding out fake ones. Be sure your own business profiles on these sites are up to date, explanatory and link back to your website. Reviews on your business profile helps your website to rank better. Search engines see real people giving true value. Never be inclined to review your own company or have friends create reviews. Google collects your information like relationships and work details through social sites, so can easily tell what is fake and what’s not. Fake reviews are more damaging than beneficial and will hurt online credibility. Backlinks are links to your website from other websites. Backlinks on relevant websites are advantageous to page rank. However, links from sites with a high spam risk can negatively affect rank. Build honest relationships with companies who have similar online values. Links throughout your content to other websites also benefit website rank. Support a point by linking to articles. Don’t be mean when it comes to links out. Google wants to build an accessible web of interesting content, so be generous. Social shares count – that is other social users sharing your content because it is worthwhile. This sends signals to search engines that your content is good, so encourage your followers to share your posts. Especially ones that link back to your website. 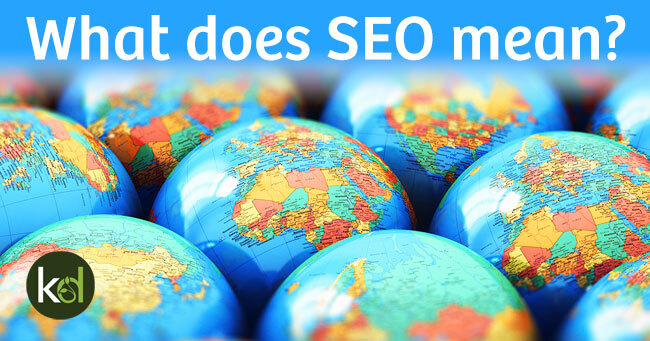 So you see, there is a lot in the answer to the question ‘what does SEO mean? But I think you’d agree after reading this post that there are reasons SEO exists and a simple, but lengthy, solution to rank well. Provide a good website for your audience, with informative answers and do not fake it.